Authentec Eikon II – Ing. Miralem Mehić, Ph.D. This week I tested Authentec Eikon II fingerprint scanner. 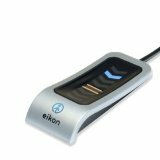 The Authentec Eikon II is a finger print scanner that is supported by Linux. The device is also available under the name “UPEK Eikon II” since the company UPEK has been bought by AuthenTec in September 2010 and sells the UPEK products under the new brand. The scanner is supported by the fprint  software under Linux, which provides several finger print scanners. Alternatively, the program FingerPrint GUI can be used. This program provides a graphical interface for the scanner and enables the X-Server loging under GDM per finger scan. The PAM module “libpam_fingerprint.so” is necessary for this. Bus 001 Device 040: ID 8086:0189 Intel Corp.
 LaunchPad, “‘Fingerprint readers integration’ team.”[Online]. Available: https://launchpad.net/~fingerprint/+archive/fprint.